V Guaridanu je Jon Buttworth, profesor eksperimentalne fizike na University College London, lepo popisal prihodnji razvoj na področju fizike delcev. 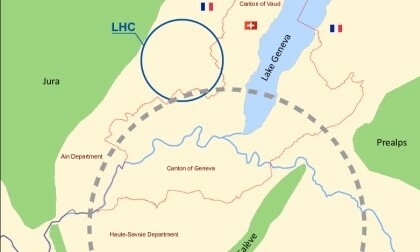 Mogočemu nasleniku LHC (v CERN/u?) se morda pridruži elektronski linearni trkalnik (na Japonskem? ), medtem ko je nevtrinski program že v polnem zagonu. It should be clear from this requirement of “Ten Tesla Magnets” alone that such a project is not for the near future and that it should not be attempted before the technology is ready. In short, they didn’t know how to build it, but they had to start doing research and development, or the technology might never exist. To build such machines, you don’t just have to exploit cutting-edge technology and engineering, you have to develop new technologies. These documents led to a meeting in 1984 much like the one that just took place. Twenty-six years later, the LHC began high-energy operation. These things take time. The picture at the top of this article shows a possible route for 100km tunnel, encircling the town of Geneva and the Salève mountain, which, if filled with suitably powerful magnets, could collide protons at energies of 100 TeV or so. Kar članek sicer ne omenja je, da je povsem mogoče, da 100TeV trkalnik zgradi Kitajska (in tudi mogoče mesto je že izbrano, uro vožnje z vlakom od Pekinga).